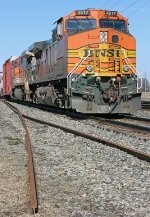 Description: BNSF Eastbound Freight Train at Edison, Ca. Description: Less than a minute after the 11J's power passed, the 20G came east with this lashup. Description: Two Warbonnets 'Original and New' Power a westbound grain train. Description: BNSF 730 leads a train off the Fallbridge Sub. Description: Amtrak 114 leads the southbound Coast Starlight into Vancouver as BNSF 730 leads a westbound into the yard. Description: Last close up shot at our favorite spot. Description: A pair of C44-9Ws lead a westbound rock train through Round Rock, Texas. Description: While watching a local train (B790) in Jordan, NY Q380-26 came into town. What a surprise! They had a slow order because of signal problems which made it easy to catch them in a few different places. They're picking up speed here at CP 300. Description: While local train B790 is backing westward down the industrial siding, eastbound Q380-26 slowly approaches a stop signal at CP 306 about a mile down the line. Description: While watching a local train (B790) in Jordan, NY Q380-26 came into town. What a surprise! They had a slow order because of signal problems which made it easy to catch them in a few different places. They're moving very slow here at signal tower 304.